In the modern era where exotic European sports cars equipped with automatic transmissions, shifted manually with paddle shifters, are not only the norm but the standard. Flashback twenty five years or more, the mere thought of an automatic transmission in an exotic European sports car was considered a rotten practical joke. This was an era when one had to have finely-tuned driving skills in order to be able to properly drive an exotic sports car. This was a time before anti-lock brakes, anti-skid control, and other computer controlled safety measures that are now the norm. With these older exotics, push them too hard in the turns, there was no computer to correct this type of mistake. These were cars you had to study carefully and spend hours behind the wheel to understand their strengths and weaknesses. It was this method of learning and experience behind the wheel which allowed a driver to obtain optimum performance from these cars. It was a real art form that in most cases took years to master. Here are the three vintage European exotic sports cars that all car nuts need to drive before they die. In other words, this is the ultimate European exotic sports car bucket list. These cars truly define the word “fun”, but they are not for the inexperienced driver or the faint of heart. They represent an era in automotive history that unfortunately will never be repeated. Those in the early-1980s who loved super fast European sports cars, the Lamborghini Countach and the Ferrari 512 Berlinetta Boxer were truly the ultimate super sports cars. However Ferrari wasn’t happy, performance-wise the Countach was giving the Boxer a run for its money. Ferrari with the Boxer still managed to beat the Countach but the margin had become very slim by the early-1980s. Ferrari felt the 1984 Ferrari 288 GTO would be the car to give Ferrari clear performance hegemony again, especially in the U.S. Market where the Boxer was not legally available for sale. With a 0-60 mph time of 4.9 seconds and a quarter mile time of 13.9 seconds the turbo V8 powered GTO was nothing short of a road rocket. The GTO’s styling was very close to Ferrari’s entry-level 308 model, which was a good thing, but the styling for most exotic sports car buyers had become a little long in the tooth by 1984. This is where the 1985 Testarossa came into the equation. It was a new design, not borrowed from any previous Ferrari. Just like other Ferrari body designs like the 308, the Testarossa’s lines were created by Pininfarina. The Testarossa was subjectively the most beautiful super sports car tever be produced. It was a very wild design with a long front hood and a super-wide rear section with massive side finned vents for engine cooling. Yet the design was also elegant. Somehow Pininfarina managed to make these crazy proportions look so good, that even today the Testarossa is considered a legendary artistic work of automotive art. The design was so beautiful, Ferrari kept it untouched for 7 model years. 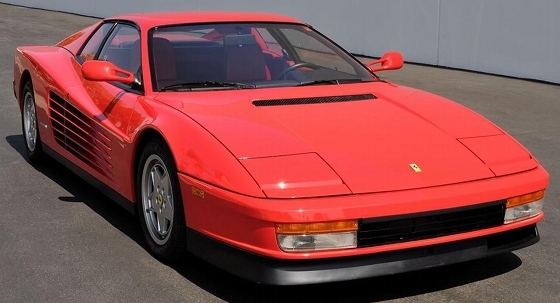 Even the late-model European exotic sports cars of today can’t match the Testarossa’s styling. A majority of Testarossas rolled off the assembly lined painted in bright Ferrari red, but this didn’t mean the Testarossa was just another pretty redhead. It was a car that was as fast as it looked. It went 0-60 mph in 4.9 seconds and the quarter mile in 13.2 seconds. It also remained true to Ferrari’s heritage (unlike the 288 GTO) by having a free-revving 12-cylinder engine. The Testarossa had a mid-engine configuration which provided plenty of space for the large Ferrari 4-valve per cylinder flat-12. This engine provided a mighty 380-390 horsepower and 361 lb-ft of torque. But the real fun was harnessing this motor via the mandatory 5-speed manual transmission with the traditional gated shifter. This combined with its wild styling and sheer power will put a smile on any car nut’s face. Not to mention precise handling which even by today’s standards would be considered top notch. This is why the Testarossa easily made this bucket list. credentials, but it was the Countach that obtained for Lamborghini it’s legendary status. The much sought after late-model Lamborghini Aventador has lots of Countach DNA in its blood. The Countach was the first car to have a steeply raked windshield. It was also the first sports car to truly appear to cheat the wind, rather than punching through it. 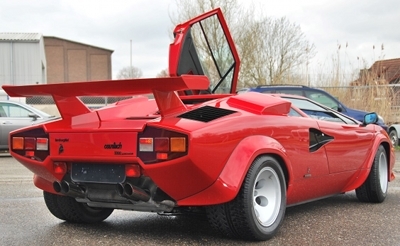 The optional massive rear wing spoiler helped to solidify this impression even though it didn’t help aerodynamics – when equipped without the spoiler the Countach was actually more aerodynamic. The Countach like the Ferrari Testarossa was a mid-engine configuration. The Countach began life with a 4.0 liter V12 which gradually grew to 5.2 liters. Though any Countach will make the perfect European Sports Car driving bucket list, it’s the 1985-1987 Countach 5000 Quattrovalvole that embodies the very best that Lamborghini has ever offered. It had the best combination of styling and performance of the Countach production run. Even the mandatory front bumper for the U.S. market couldn’t hurt the Countach’s looks. 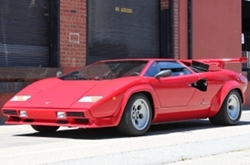 Though the Countach’s last model year was 1990, starting in late-1987 model year, Lamborghini started tinkering with the Countach’s styling by adding new lower body skirt vents and shortly thereafter new upper rear vent designs, along with a few other minor styling changes that altered the Countach’s perfect lines. Many Lamborghini purists were not happy with the changes that started with the late-1987 Countach. Rewind back to the early-1980s, the Lamborghini Countach had become the ultimate performance sports car and the Ferrari Berlinetta Boxer was its main competition. The early-1980s Countach could hit 0-60 mph in 5.6 seconds and the quarter mile in 13.9 seconds. It was the release of the 1985 Ferrari Testarossa that forced Lamborghini to release the 5000 Quattrovalvole (4-valves per cylinder) 5.2 liter V12 version of the Countach, that dropped the 0-60 mph time to 5.1 seconds and a quarter-mile time down to 13.5 seconds. It’s this performance, a mandatory 5-speed manual transmission (with a gated shifter), a great handling suspension, and its beautiful and outlandishly styled lines that make this Countach a must drive for any bucket list. Today many consider Lamborghini to be superior to Ferrari, without the 1985-1987 Countach 5000 Quattrovalvole this never would have been possible. Wangers, who fathered the idea. It was brilliant maneuver, taking the best sports car in the world and having it go head-to-head with Pontiac’s new muscle car. It was this association alone that raised the Pontiac GTOseveral notches up the performance ladder. Let’s face it, there’s a reason why Pontiac stole the “GTO” name from Ferrari – the name meant something because the Ferrari GTO was just that good of a performance car. In reality the matchup was a joke, the Pontiac GTO may have handled well for an American car but it was no match for the GTO which was the world’s best handling car. Matching up the Ferrari GTO against the Chevrolet Corvette would have been a closer match. The Corvette just like the GTO had the grunt under the hood to not be too embarrassed when competing against the much lighter and quicker Ferrari GTO. In the handling department it was different story, the GTO made the Corvette appear to handle like a full-size Chevy Bel Air. The Ferrari GTO’s beautiful curves blend so well together. The long front hood, the short deck-lid, and fastback style roof all seem to blend together in perfect harmony. As great as the styling was, it would have been another pretty face with good performance like the Jaguar XKE of the same era. Instead its small-displacement 3.0 liter V12 engine produced a very impressive 302 horsepower. This was back in an era when 300 horsepower was a lot of grunt especially in a 1,940-lb car. The GTO went 0-60 mph in 5.4 seconds and the quarter-mile in 13.1 seconds at 113 mph. Even more than 50 years later these figures are mighty impressive. The truth is, back in 1962-1964, nothing could touch the Ferrari GTO’s performance and handling. The GTO came standard with a 5-speed manual transmission (with a gated shifter), more than two decades before U.S. automakers offered a 5-speed manual with its performance cars. For all these reasons the Ferrari GTO is a must drive for any bucket list. 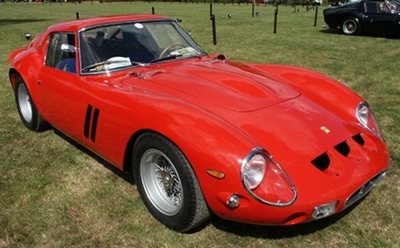 The Ferrari GTO currently has the highest monetary value of any production classic car. The 250 GTO was produced in very low numbers (only 39 produced) – it’s a real rarity when one comes up for sale. When one does, it usually set sales records. In the last few years two Ferrari GTOs sold for around $38,000,000. Unless you become a real estate tycoon, win the PowerBall, or invent the next Facebook type Internet sensation, the probability of driving a Ferrari 250 GTO is as likely as a trip to Mars.